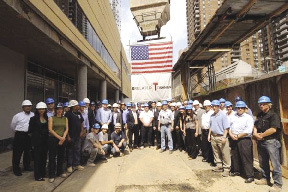 Hundreds of construction workers and principals of owner/developer Related Companies and construction manager Tishman Construction Corp. celebrated the topping out of 440 West 42nd St., as the final bucket of concrete was lifted to the roof, where it became part of the building's structure. The project is a new, $800-million, 60-story mixed-use complex designed by Arquitectonica and Ismael Leyva Architects. It will contain more than 800 units of rental and for-sale residences, including 163 affordable units, and the area's first Yotel hotel. It will also house the Signature Center, an off-Broadway theater complex designed by Frank Gehry. "We are delighted to celebrate this important milestone in the project's history and in the development of Midtown's West Side," said Bruce Beal, Jr., executive VPof Related Companies. "This mixed-used complex continues Related's long-standing commitment to affordable housing and sustainability by pursuing a LEED-Silver rating and integrating various energy-saving measures. It will also incorporate the Signature Center, a world-class performing arts center that will enhance existing amenities and attract additional cultural institutions to the neighborhood."